As a student, I was a big proponent of post-it notes. In the run-up to my final show, I had a mosaic of everything I needed to get done on small orange pieces of paper stuck to the wall of my student bedroom. There were a few problems with this system. The first was that everything on the wall became, almost instantly, out of date. The second was that my low-grade student post-its were no match for old paintwork and overzealous central heating, so would intermittently flutter to the ground and off my radar. I’ve since left those days behind, but I’m still a fan of getting things off the computer screen and onto paper. Over the years I’ve found that I almost always see something new once something is IRL, and storyboards are no exception. So, if you too are a believer in seeing things differently offline, I have good news. We’ve just launched a brand new portrait PDF template, specifically designed to be printed out and stuck up on your wall (this will work on any wall, bedroom or otherwise). The margins are a little tighter than on our landscape templates to pack as much information onto the printed page as is practical. Portrait layouts are an oft-requested feature (and are for many the classic way a storyboard should be laid out), so we hope the new template will come in handy. As part of this update, we’ve also launched our new Storyboard Exporter. With it, you can see how the settings you change will alter your layout in real-time. We’ve also rolled in our bulk download and After Effects plugin functionality into the same interface, so all your export functionality is under one roof. 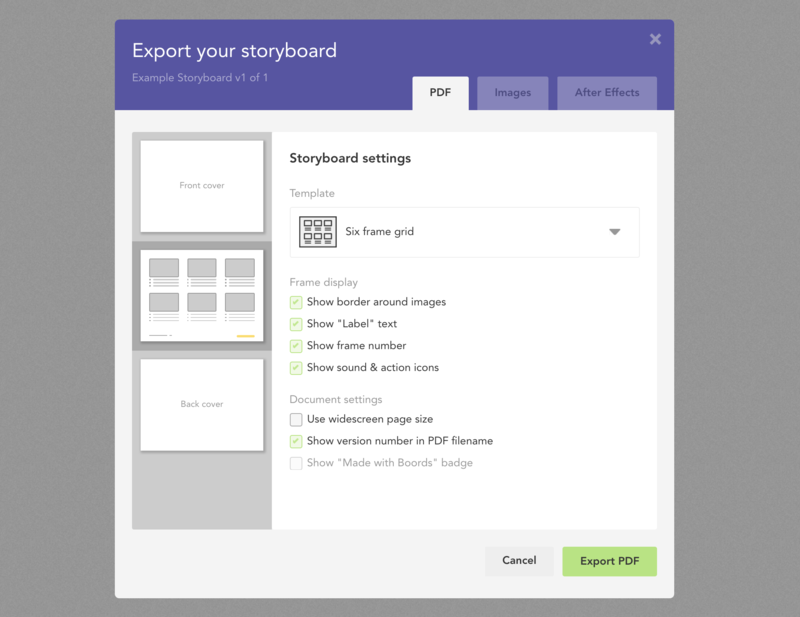 The new Storyboard Exporter and portrait template is accessible for all Boords users. We hope they make a positive difference in your workflow. If you have any thoughts or an idea for a feature you’d love to see, just let us know in the comments.